Last week I met Rebecca, who was waiting for an Amtrak train in Penn Station. I recognized that they were kanji, but I didn’t know that they were reiki symbols. Reiki is a Japanese healing art, and Rebecca is a certified reiki practitioner. As part of her certification and training, she studied enough to know that these symbols are accurate and refer to graphic representations of healing. Her right wrist speaks to long distance healing, and her left wrist refers to balance and healing. 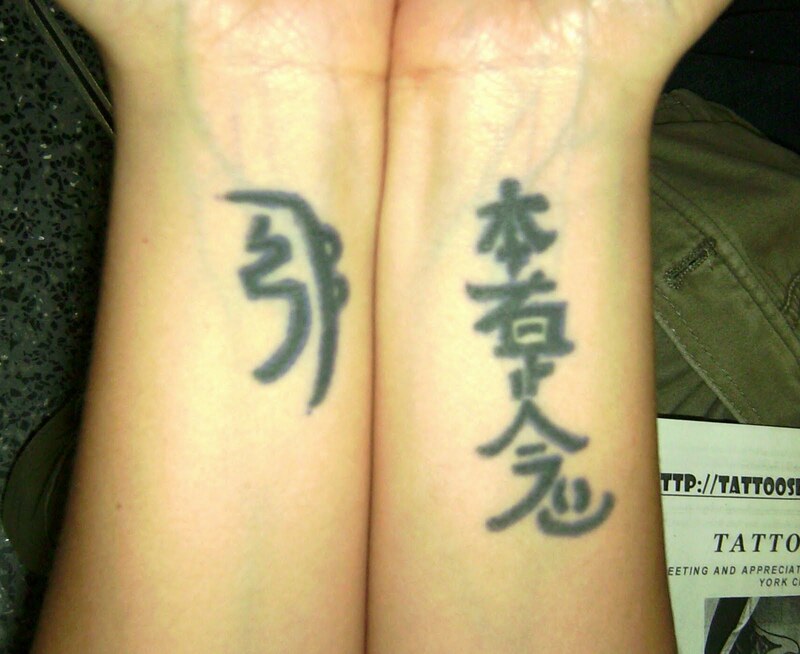 Since reiki practitioners work with their hands, it seemed fitting that she had these symbols on her wrists. She noted, as my wife has told me about her wrist tattoo, that the pain was very intense on this part of her body and that she passed out not once, but twice, in the course of having these tattoos inked over two sittings. The tattoos were done at Gothic Tattoo & Body Piercing in New Hampshire. Thanks to Rebecca for sharing her healing tattoos with us here on Tattoosday!